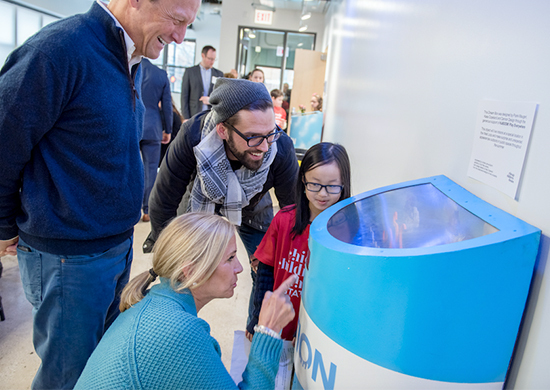 One of the more rewarding efforts our Chicago team has recently taken part in is the launch of Chicago Children’s Theater’s (CCT) Dream Box project. The project, launched in partnership with Kaboom! Play Everywhere, is a creative collaboration with three local schools to help Chicago’s youth envision the future of Chicago. The results are four Dream Boxes located around the city that offer peeks into the future world from the minds of Chicago children and also bring Chicagoans together through free public art. “The Dream Box project aims to elevate children as the authors of our city and inspire them to imagine what the urban future could look like,” said Frank Maugeri, Community Programs Artistic Director of the CCT. To create the dream boxes, CCT led conversations with students at the three area schools to spur their imaginations and understand their dreams, visions and beliefs about the future. The children’s creative imaginings were collected and provided to noted Chicago visual artists including Kass Copeland, Andres Lemus-Spont and CoCo Ree Lemery, who realized their innovative ideas in miniature scale. Our team collaborated with CCT and the local artists to create the boxes, which resemble post-modern, outdoor mailboxes. I had the good fortune of attending a ribbon cutting event for the new CCT theater and see the boxes up close with students last week. Now created, the Dream Box structures will also live on for lasting, long-term community impact, as the art inside can be updated or changed with new themes by new sets of students.